Steve Tanis, left, and his partner Rich Garraputa, both from Greensboro, N.C., walk toward the Noth Carolina Legislative Building after a rally against a state constitutional amendment that would say marriage between a man and a woman is the only domestic legal union in North Carolina, on Halifax Mall in Raleigh, N.C., Tuesday, Sept. 13, 2011. 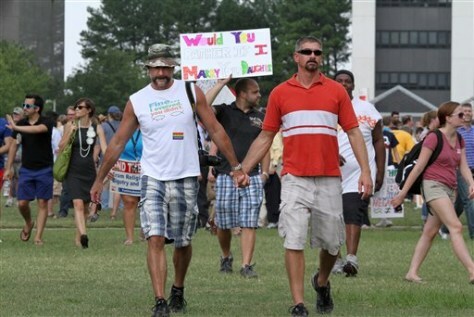 The N.C. Senate voted Tuesday to put the marriage issue to a vote in 2012. The men have been together for 13 years.